Chicago—ALA Publishing eLearning Solutions announces a new facilitated eCourse, Using and Understanding Library of Congress Subject Headings. Bobby Bothmann will serve as the instructor for a 6-week facilitated eCourse starting on Monday, Nov. 5, 2018. 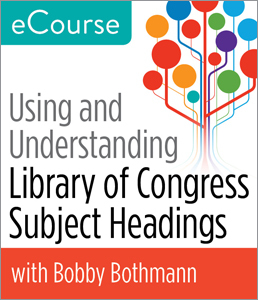 In this 6-week eCourse, Bobby Bothmann introduces you to the Library of Congress Subject Headings (LCSH) vocabulary and explains the various types of topical and free-floating subject terms. You will learn how to analyze the contents of a resource and convert that analysis into the LCSH controlled vocabulary. Throughout the course, you will use the print and free online LCSH vocabulary, consult the Subject Headings Manual, and encode subject analysis in the MARC 21 Format for Bibliographic Data. This eCourse addresses the various types of free-floating subdivisions; the treating of names of persons, families, and corporate bodies as subjects; the use of the rules of three and four; and looks at special problems in subject analysis. Synchronous and asynchronous small group discussions will take place. Each weekly module includes a set of exercises, building each week on what was learned in prior weeks. The dates for the two live events are Friday, November 9 and Friday, December 7, both starting at 1:00pm Eastern/12:00pm Central/11:00am Mountain/10:00am Pacific. The live events will be archived and recorded for those that cannot attend live.